©Mary Moquin, Just to Be. The Guild of Harwich Artists announces an opportunity for the public to watch Cape artist Mary Moquin create a new work in mixed-media, on Saturday January 21st, at 2:00 at the Harwich Community Center at 100 Oak Street in Harwich. Mary will be talking about her painting process, including the thought process as well as the actual hands on demonstration of the various materials she incorporates in her paintings. Mary works primarily in oil, but sometimes begins with drawing materials, crayons or acrylics combined with clear gesso as a foundation. 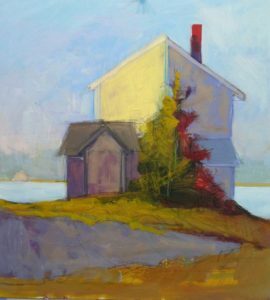 The Guild of Harwich Artists hold monthly meetings September through May at the Harwich Community Center, 100 Oak Street, Harwich. Each meeting features a well-known Cape Cod artist demonstrator. All programs are free and open to the public.